For years commuters in Seattle, Washington have fought gridlock and long commutes. In November 2003 Sound Transit broke ground on a critical section of their long term transportation plan to help alleviate growing congestion problems. Their answer is a 15.9 mile long Central Link light rail project that will connect downtown Seattle and Tukwila to the south. 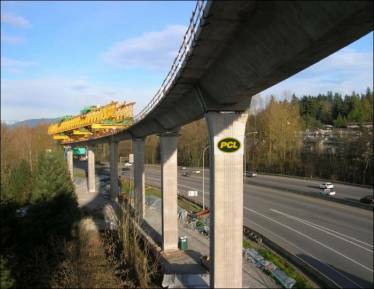 The current stage of the project is working south towards Tukwila with over 4 miles of elevated guideway structure. Portland Bolt was selected to supply the anchor bolts for the overhead cantenary system (OCS) that supplies electricity for the trains. Gary Rusynyk, in our office, is coordinating our efforts with the general contractor. His extensive experience in the construction fastener industry spans over 28 years. He has provided material for over 30 light projects all over the country, including Denver, Colorado, Tampa, Florida and Baltimore, Maryland. Through his excellent service and clear communication of our manufacturing capabilities, Portland Bolt has become a trusted supplier for this project. To date over 97,000 pounds hot-dip galvanized ASTM A354 grade BC high strength anchor bolts have been provided. With our large raw material inventory and in-house hot-dip galvanizing these anchor bolts have been delivered as promised, preventing any gridlock for this part of the project.